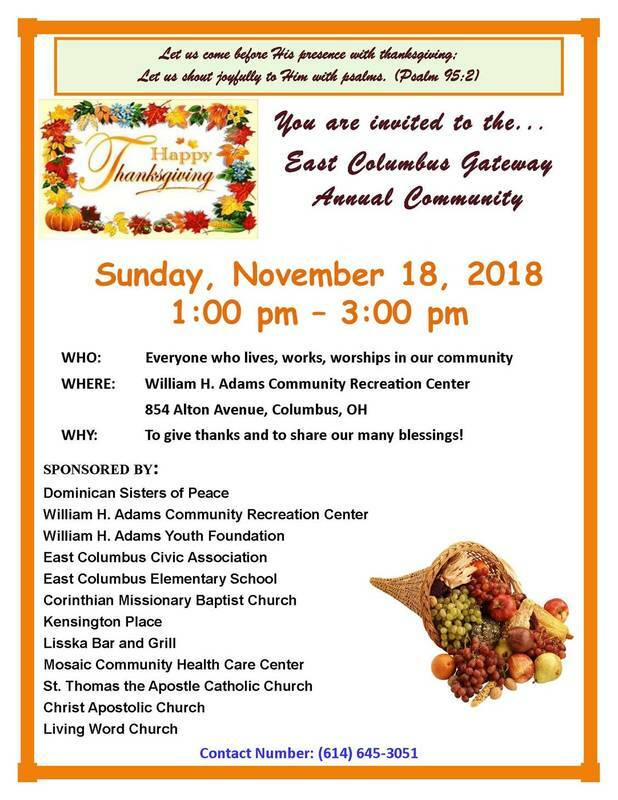 The Adams Foundation, in partnership with other community organizations, sponsors the Annual East Columbus Community Thanksgiving Dinner on Sunday, November 18th, 1:00 to 3:00 at the William H. Adams Community Recreation Center at Krumm Park. We ask for your support of this event with financial donations or volunteer service. Last year we served over 500 residents of the East Columbus neighborhood and we expect close to 600 this year. The event has gained in popularity over the past few years, moving from a church basement to the Recreation Center gym. For donation of food items, including desserts, beverages, or consumables, contact Adams Recreation Center Manager Mario Dovell at mcdovell@columbus.gov. Many meals are prepared for delivery to elderly or shut-in’s, so take-out containers are a big requirement. Your tax deductible financial contributions may be made on the Adams Foundation website here. The William H. Adams Youth Foundation is dedicated to a legacy of community service and leadership. The mission of the Foundation is to support programs and opportunities for the youth of East Columbus. By partnering with quality organizations that deliver a diverse mix of programs and activities, the Foundation will do its part to enrich the lives of young people and their families. Programs supported by the Foundation share our mission to provide safe, healthy, educational and fun activities for at-risk youth in the East Columbus community. The Adams Foundation partners with Operation Homefront for the annual Back-to-School Brigade™, a national school supply collection campaign. Last year the program distributed over 25,000 backpacks filled with school supplies to military families and communities across the country. Dollar Tree is the presenting sponsor and will set out collection barrels July 5th through August 11th at over 5,000 Dollar Tree and Deals stores nationwide. Working with youth is like throwing a stone into a pond; the ripples keep expanding far beyond our time and place, far beyond our ability to measure or even envision. A program to assist young students with literacy. See video of the Ceremony here. Copyright © 2016 The William H. Adams Youth Foundation, Inc. Columbus, Ohio. All Rights Reserved.